The counter at Petunia’s filled with tons of goodies. I have been following Petunia’s Pie and Pastry for quite some time. Just recently she went from a cart at the Farmers Markets to a brick and mortar. It’s not just me, many people were following her and as she opened her new place the reviews started coming in about how great her food is. What I don’t remember people mentioning is how dang cute this place is. This place is Shabby Chic meets darling. I can’t get over how great it looks. All the way down to the attire that the servers wear. The attention to detail in this place is spot on. You walk in, you see and feel a theme and you can’t help but smile. Simply amazing!! Now let’s get to the food. First off it’s not just pie and pastries. They do have a few savory dishes if you would like to grab a lunch and they also offer beer, wine and cocktails. It’s a little bit of everything. What they focus on is gluten free and vegan. Ok, before I lose you, pay attention. I need neither of those adjustments in my diet, but I always like to see if places like this can deliver. Olive Oil cake with citrus. There was quite a selection when we got there, right before closing. She did describe some favorites that they were out of, that sounded great. I quickly eyed the Olive oil cake with citrus. It just looked moist and I knew it would be with olive oil. I also don’t enjoy overly sweet desserts and this one looked like it could offer just the right amount of sweetness, and I was right. My husband who was really against the whole gluten/vegan outing even loved it. 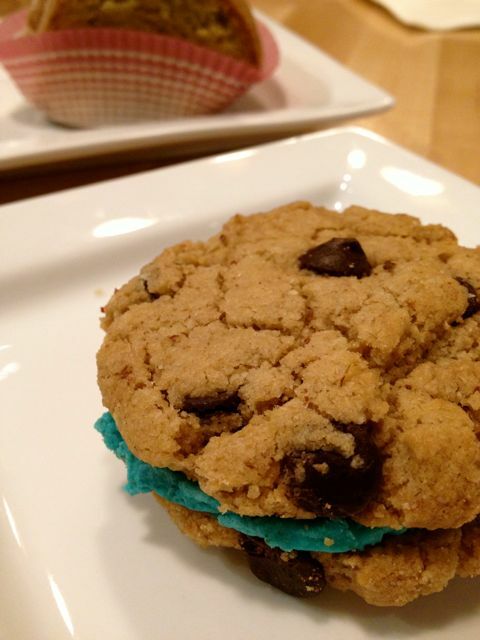 The stuffed chocolate chip cookie. The second option we got was the cookie. I had to crack up at my husband that he got something that had blue in it, but he was pretty excited about, so blue it was. This too was a great cookie. It’s different than regular cookies, I had to remind my husband of that, it is vegan remember, but it still delivered a great taste.The desserts here were amazingly beautiful. Which doesn’t surprise me since the whole place was just stunning. This is s a perfect place for a mother daughter date or a girls night out. Guys bring your girls in for dessert and anyone with a mother, should bring their mother in as well. Atmosphere was Shabby Chic meets Darling. I personally think this is the best restaurant in Portland for decor and theme alone. Pricing was great. We got 2 treats for just $6. Service was very good. You do order at the counter, but they were super helpful and so cheery. How could they not be working in this cute atmosphere. They serve wine, beer and cocktails. 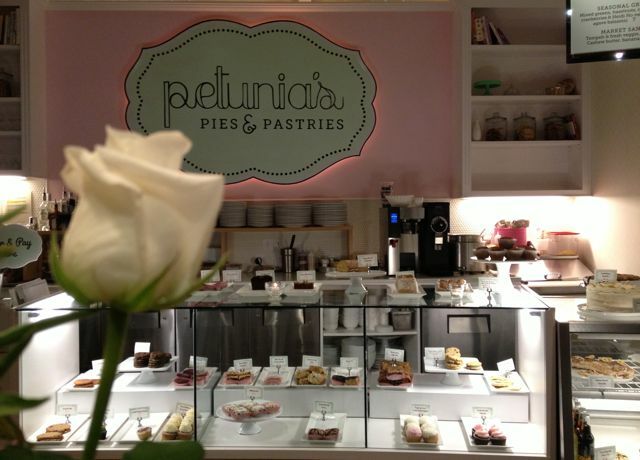 Petunia’s Pie and Pastries is located on SW 12th. My boyfriend recently went gluten free and I’ve tried to make some sweet gluten free treats…some recipes were ok but most fell short. 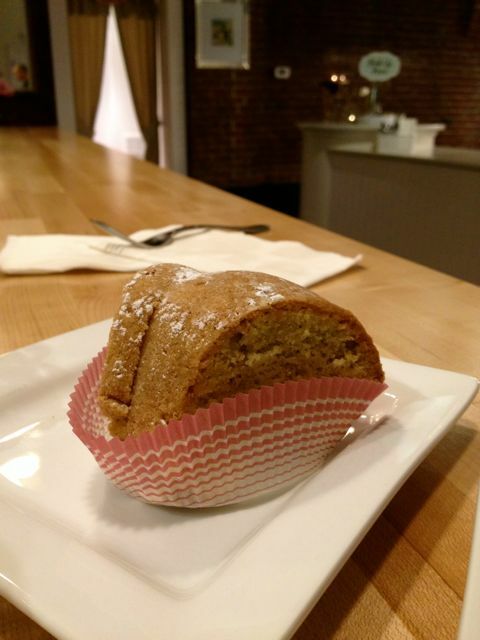 We went to Petunia’s to see what GOOD gf baking should taste like. It was really good! And an adorable place.